Derek I first used the product and it came out in large lumps. I used a wet paint brush and dabbed the area I sprayed. It was ok but I decided to apply another coat the next day. This time I shook the can for 15 minutes. I first sprayed into a cardboard box until I liked the consistency. Then sprayed the ceiling area again. This time it looked much better. I painted the area the following day and you would have to really look to find the patched area. Whatever retired I purchased this product, even after reading the negative reviews. I felt that if I were to follow the instructions to the letter and then some, the chances of success would be greatly enhanced and would make the investment in time and money worrth while. The added preparation consisted of shaking the can for a total of 15 minutes in 3 minute intervals over a 24 hour period. As the time went by, you could hear and feel the metal ball slap around in the can with less effort while shaking. When you consider the amount of time that the product may sit on the shelf from when it was manufactured, it makes sence that the consistancy of the contents would be much thicker as the particulate would settle out and become more dense than when it was first installed in the can and therefore require more shaking than what the instructions call for. It would, I'm sure make for a much more successful experience in the use of this product if this were included in the instructions of use. DaddyG Needed to repair approx. 1 ft x 2 ft area in ceiling. Followed the video instructions and got Great results. Would take a practiced eye to see the repair. I'm impressed.... surfface preparation and plenty of plastic sheeting is paramount! littleha I had removed a ceiling light fixture and had to repair the hole left over. Ceiling repair came out very good. Make sure to follow the directions and put up plastic drop sheets to protect areas from the excess splatter. Anyone who comes over to my house will not see where a repair was done unless they look very closely It is almost impossible for any product to produce an exact duplicate for the existing texture. Dante1 I bought one can to do a repair around a light fixture and it turned out great. However, when I did the same to another light fixture, it came out in clumps. I thought that it was a one time use and purchased another can. The directions say to hold the can 10" away from the ceiling but when I started to spray, the texture didn't go as high as 3". I made a mess everywhere. I am very disappointed and also the fact that I wasted my money! pc1995 I bought this to repair the popcorn ceiling where the roof had leaked and the popcorn fell off. I read the directions and did exactly as they said (shook the can for 15 minutes). I started with the two smaller areas and it worked perfectly. Then moved to the larger area where I had to remove furniture and cover the rugs and it stopped spraying. Turned it upside down, air came out but no paint. All the shaking in the world would not make it spray. It was the least expensive on the shelf. I'm going to return it (I only used about a third of the can) and will spend a little more to get a better product. Very disappointed. Could not go back that day to return so had to put everything back and finish another day. Big hassle. BobB Mixture was too watery and looked more like over saturated instant oatmeal than popcorn when applied. Far to runny. I'd suggest this product be taken off the market. Steve Product does NOT work as advertised. Just shoots out massive globs. Ruined all our work. Had to start over. WORST PRODUCT I'VE EVER USED! Not at all as advertised. Homax Products should be reimbursing cost and damages. BEWARE!!! ton1970 I follow instructions sprayed out all over my clothing and hair . Got on my carpet and blinds . Huge mess didn't work at all. They should pay to clean my carpet. 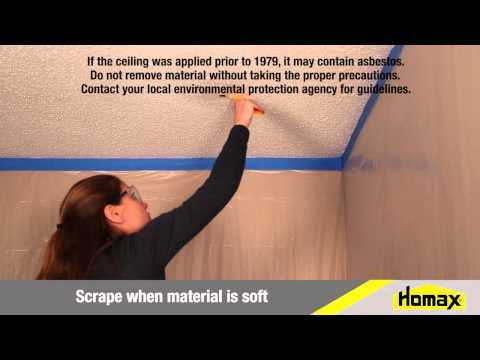 Homax Easy Patch Popcorn Ceiling Texture is ideal for repairing or applying popcorn texture. Our new and improved actuator allows for easy vertical spraying of material. The water-based formula is dispensed in an aerosol, allowing you to easily make small repairs to damaged popcorn ceilings, plus it is easy to clean up. Low odor. One 14 oz. can covers up to 4 sq. ft. Popcorn ceiling repair can be a challenge for homeowners. Whether your ceiling texture is stained or damaged, blending in the new popcorn texture with the existing texture is critical to achieving a flawless, professional finish. Homax makes it easier to create an invisible repair with our aerosol ceiling repair products. Homax® Easy Patch Popcorn Ceiling Texture is ideal for repairing or applying popcorn texture. Our new and improved actuator allows for easy vertical spraying of material. The water-based formula is dispensed in an aerosol, allowing you to easily make small repairs to damaged popcorn ceilings. Covers up to 4 sq. ft.
DIYers: No need to call in an expensive contractor. Homax gives you the power to repair your own popcorn ceiling texture. Homax Aerosol Ceiling Texture, Popcorn is the fastest way to patch damaged popcorn ceiling textures. To achieve the best results, please read the following directions carefully before you begin your textured ceiling repair project. PROTECT WALLS AND SURROUNDING AREA FROM OVERSPRAY. Water-based, use warm water for clean up. DIRECTIONS FOR USE: MAKE ANY NECESSARY CEILING REPAIRS BEFORE APPLYING. WATER DAMAGED OR STAINED AREAS SHOULD BE PRIMED / SEALED WHITE PRIOR TO USE. Shake can vigorously for 1 minute. Carefully insert straw into nozzle. Hold can vertically approximately 10-14” from ceiling. SPRAY using a sweeping (back and forth) motion. To store: remove straw, turn can upside down and spray until texture is cleared. DRY TIME: Allow texture to dry 24 hours if painting is required. DANGER! FLAMMABLE VAPOR. CONTENTS UNDER PRESSURE. CAUSES EYE, SKIN AND RESPIRATORY TRACT IRRITATION. Contains Calcium Carbonate, Clay, Perlite, Titanium Dioxide and Dimethyl Ether (propellant). Vapors may catch fire. Keep away from heat, sparks and flame. Extinguish all flames and sources of ignition during use and until all vapors are gone. Prevent build-up of vapors by opening all windows and doors to achieve cross-ventilation. Store upright in a cool, dry place. Avoid prolonged exposure to sunlight and other heat sources that may cause bursting. Do not puncture, incinerate, burn or store above 120°F. Use with adequate ventilation. Avoid breathing vapor and spray mist. Avoid contact with eyes and skin. Wear safety glasses or goggles. Wash hands after using. FIRST AID: For eye contact, flush thoroughly with water for 15 minutes and get medical attention. For skin contact, wash thoroughly with soap and water. If inhaled, remove person to fresh air. If breathing does not improve, get medical attention.